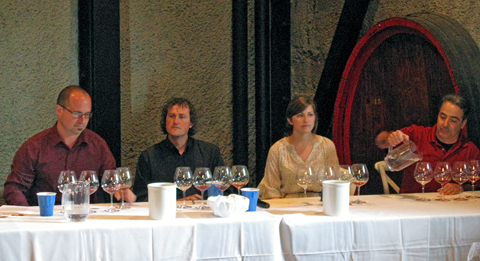 Report on the 11th annual Pinot Paradise Technical Session and Grand Cruz Wine & Food Tasting presented by the Santa Cruz Mountains Winegrowers Association, on Sunday March 22nd, 2015 at The Mountain Winery in Saratoga. 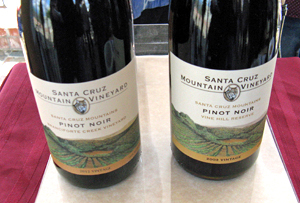 The event focuses on Pinot Noirs from the Santa Cruz Mountains AVA. Pinot Paradise is a multi-day event, and started this year with the Saturday “Pathway to Pinot Paradise,” with special tastings at over 25 wineries throughout the region. Sunday began with a morning Pinot Noir Technical Session, and the grand finale to Pinot Paradise was the Grand Cruz Tasting on Sunday afternoon. There was also a silent auction during the Grand Cruz Tasting. I attended both the Technical Session and Grand Cruz Tasting this year. The Santa Cruz Mountains Winegrowers Association (SCMWA) helps to promote wineries and wines from the area. The Santa Cruz Mountains AVA was established in 1981, and includes parts of Santa Cruz, Santa Clara, and San Mateo counties. Vineyard elevations in the AVA range from 400 feet to over 3,000 feet, with some sites lying below the “fog line” and some above – the varied subregions of the AVA feature a number of different soil and climate profiles. Given the mountainous terrain, it's no surprise that most of the 200+ vineyards in the region are small, with a total planted area of less than 1,500 acres. 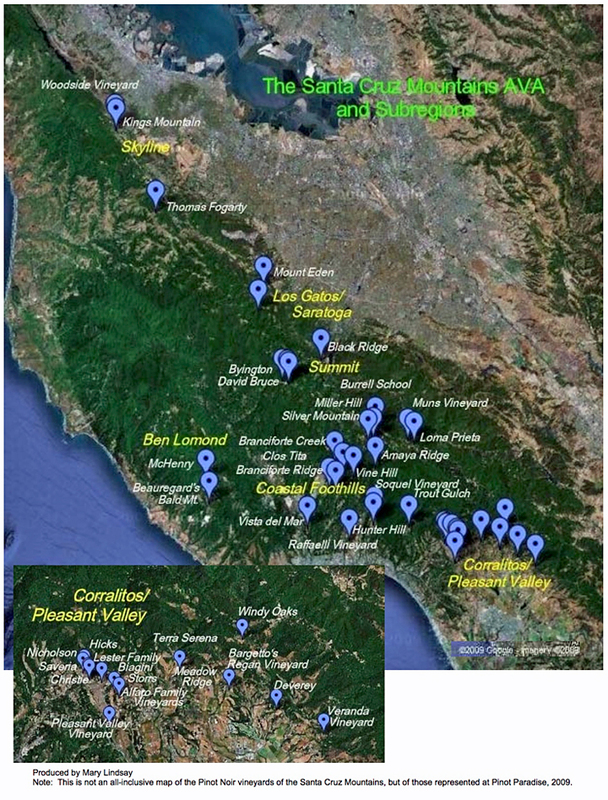 Over 60 wineries, most of them quite small and family-run, are currently members of the Santa Cruz Mountains Winegrowers Association. Both the Technical Session and Grand Cruz tasting were hosted again this year by The Mountain Winery, in the hills high above Saratoga. This is one of California’s most notable winery sites, with a history that stretches back to legendary vintners Paul Masson and Martin Ray. On a cool and drizzly morning, Technical Session attendees trickled into the historic winery’s Grand Hall – a handsome space with stone and concrete walls and an open wood truss ceiling – for an early 9am start. There was a brief welcome by current SCMWA President Dave Moulton of Burrell School Vineyards & Winery, followed by an introduction of the speakers by Prudy Foxx of Foxx Viticulture. Dr. Gary Griggs, Professor of Earth Sciences at UC Santa Cruz, started us out with “The Geologic History of the Santa Cruz Mountains.” He led us through an informative visual presentation, giving us a brief introduction to the complex rock and soil formations of the region. 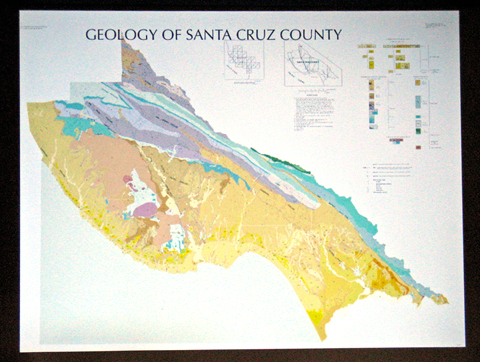 Beginning with plate tectonics, he explained that rocks of the Santa Cruz Mountains were originally formed out of material scraped from the seafloor that resulted from subduction of plates from the Pacific Ocean being forced beneath the North American Plate – this helps account for the great variety of rock and soil types. The San Andreas Fault runs right through the region, with many smaller branch faults nearby, and these faults have helped push up the mountains and deformed the rock formations greatly. The oldest rock formations in the region are metamorphic, mainly schist and marble – these are up to 200 million years old. A large part of the Santa Cruz Mountains is composed of igneous rock, primarily granite that has intruded upward through other material. Dr. Griggs pointed out that there is not a lot of granite rock exposed at the surface, as you see in the Sierra Nevada mountains, as it has been broken down into decomposed granite soil. Younger sedimentary rock such as shale, mudstone, and sandstone are found in many areas as well. The sedimentary Purisima Formation – only three to five million years old – contains a wealth of marine fossils. He mentioned that the area around The Mountain Winery, above Saratoga and Cupertino, is largely composed of Franciscan Formation rock. This complex formation of mostly metamorphic rock extends from Oregon to Santa Barbara County. Dr. Griggs spoke about soil types and how these differ from the primary rock material of the area. He told us that soil formation depends on a number of factors – climate, relief (topography and elevation), organic activity, parent material, and time. A Santa Cruz County soil survey from 1980 identified 84 different soil types in the county – and with a good part of the Santa Cruz Mountains extending into San Mateo and Santa Clara Counties, there are likely to be a number of additional soil types there. With so many small vineyards (over 20% planted to Pinot Noir) scattered throughout much of the Santa Cruz Mountains, it’s easy to see that these many soil types are likely to play a significant role in the distinctions between wines from different parts of the appellation. We jumped right into the second Technical Session of the morning, “Identifying Signature Elements of Santa Cruz Mountains Wines,” presented by Luke Sykora, senior editor at Wine & Spirits magazine. Continuing the theme of our first presentation, he started by pointing out that it’s difficult to expect a consistent character for Santa Cruz Mountains wines as a whole due to the diversity of the region. He moved on to talk about how the idea of a signature wine character of a region or even of a single vineyard (terroir) can easily be obscured by winemaking practices as well as by practices in the vineyard itself. For example, the choice of clones, rootstocks, irrigation, trellising, canopy management, etc. can have a major impact on the character of a vineyard’s fruit. Luke talked about categories of wine descriptors that can help identify a consistent character – if there is one. 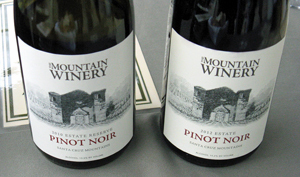 He used descriptors that have been used in Wine & Spirits reviews of Santa Cruz Mountains Pinot Noir. The first category was “aroma,” and Luke noted that common descriptors have included conifer, woodsy, forest floor, as well as savory, earthy, floral, and mushroom. He noted that a number of these descriptors occur for wines from other areas similar to the Santa Cruz Mountains that don’t have a major grapegrowing monoculture such as Napa Valley does, as well as from areas with fairly dry climates where oils from nearby aromatic plants may affect the fruit. He also pointed out that some of the more “woodsy” descriptors could simply be a subconscious response by reviewers to wines from this region that’s well-known to be heavily-forested. We moved on to “tone of fruit” descriptors, with strawberry, cherry, raspberry, and a few others being commonly used. Luke noted that this more red-fruited character is not unlike some other appellations such as the Sonoma Coast, and that it varied by specific spots in the Santa Cruz Mountains, particularly by the vineyard elevation. Higher-elevation vineyards tend to be warmer since they are above the typical fog line, while lower-elevation sites such as the Corralitos area are usually cooler. 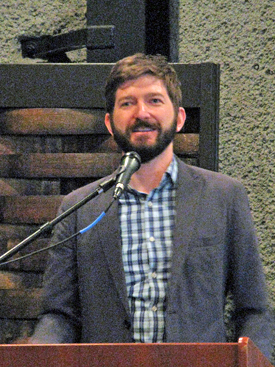 Luke followed up with descriptors of “structure,” noting that fruit from mountain vineyards tends to produce wines described as mineral, black, potent, and even challenging. Santa Cruz Mountains Pinots are well-known for greater tannic structure than those from most other California Pinot regions. Summing up, Luke described what he thinks of as the Santa Cruz Mountains’ “cool” Pinot character – red fruits that can have woodsy aromatics, bright acidity, and firm tannins. After a short break, we continued with a Winemaker Panel discussion, featuring John Benedetti of Sante Arcangeli Family Wines, Denis Hoey of Odonata Winery, Olivia Teutschel of Bargetto Winery, and George Troquato of Cinnabar Vineyards & Winery. Each winemaker presented two wines that we all were able to taste while they talked about their vineyard sources and winemaking methods. I’ve included my impressions of these wines with the other tasting notes below, with a note that they were tasted at the Technical Session. John started out, and he told us that he is not looking to make powerhouse wines, but to craft wines that reveal themselves over time like “rings of an old tree.” A key vineyard source for his Pinot fruit has been Split Rail Vineyard, at 1,700 feet elevation in the Corralitos area, planted to the “David Bruce selection” field blend of clones from 1986-1991. Some of the cuttings used for this selection came from Martin Ray’s original Mount Eden vineyard, which in turn came from vines that Paul Masson had established from cuttings he obtained from Burgundy in the late nineteenth century. John uses all destemmed fruit for his Pinots, and starts them with native yeast though he inoculates some lots with yeast strains including Assmannhausen and RC212. George was next, and told us that he had started with Cinnabar in 1990 and that the winery had increased their Pinot program in the late 1990s. After the old Cinnabar vineyard site was sold to Mount Eden Vineyards in 2007, they continued purchasing Pinot fruit from local vineyards such as Lester Family Vineyard in Corralitos. George said that older vintages were made to be very fruit-forward but that he’s now looking to make more nuanced wines. The third winemaker to speak was Olivia. She told us that the Bargetto family has been making wine in the Santa Cruz Mountains for over 80 years but that they only started making Pinot in 1995. The well-known Regan Vineyard in the Corralitos area is Bargetto’s estate vineyard. Olivia typically inoculates fermentations with Assmannhausen yeast, and ages Pinots in both French and Hungarian oak. She said that the Bargetto Pinots are aiming for a fairly big, extracted style. Denis was our final speaker, and told us that he started out on the path to becoming a winemaker by working with Jeff Emery at Santa Cruz Mountain Vineyard. He said that he looks for diversity in soil and in Pinot clones when choosing vineyards to work with. He presented wines from two sites – Domani in the Summit area, which has six Pinot clones and has thin soil at about 1,900-foot elevation, and Falcon Hill in the Happy Valley area, with three clones in denser soil at 400-foot elevation. He mentioned that he’s been working with this vineyard to reduce irrigation water use in recent years and has cut that back by about 75%. All his Pinot fruit is destemmed and he uses several yeast strains for fermentation, including RC212 and W15. This was a very well-run Technical Session program. The topics and speakers were interesting, showed us different approaches to making Pinot, and gave us some things to think about going into the Grand Cruz Tasting. And as a bonus, things ran so smoothly that we finished up right on time – an unusual occurrence for this type of program! This was the third straight year I’ve attended the Pinot Paradise Grand Cruz Tasting after a few years when I’d been unable to make it there. The event continues to be an excellent opportunity to taste Pinot Noirs from many producers and to get a broad overview of the state of Santa Cruz Mountains Pinot. 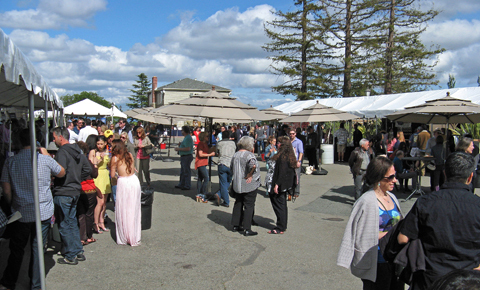 This was the second year that the Grand Cruz tasting was held outdoors at The Mountain Winery. Unlike last year’s gorgeous weather, this year was cool and breezy. Fortunately, the little rain that fell that day occurred before the tasting, but the clouds didn’t clear for good until later in the afternoon. As was the case last year, tents covered each wine and food station. And once again, the silent auction ran concurrently with the tasting. The wine and food table configuration was a little different from last year, and not all the tables were arranged alphabetically this time, which made finding a few of them a bit more difficult. But the overall layout was handled well, and the space did not feel crowded at all. It was tough to get a good read on whether there were more or fewer attendees this year, but it seemed to be a fairly good turnout. The Pinot Paradise Grand Cruz Tasting continues to attract terrific food purveyors. I mixed in some food sampling along with the wine tasting – trying to avoid the spicy and sweet foods until the end of the day – and found some standouts. Cin-Cin Wine Bar & Restaurant (Asian duck salad), California Café (figs with blue cheese wrapped in prosciutto with a balsamic glaze), Nonno’s Italian Café (salmon, penne pasta with meatballs, meatball sliders), and Bruno’s BBQ (I didn’t note what they served, but I’m sure it was BBQ!) were my favorites there. Grape-Nutz colleague Al Osterheld joined me at both the Technical Session and the Grand Cruz Tasting, and we were able to sample the wines of all 35 producers that presented their wines at the tasting. Because wineries at this event are limited to pouring only two wines (though a handful poured a third one), it was possible to taste all of the wines poured there. Most Pinots were from the 2012 and 2013 vintages, with a few from 2009-2011, plus a handful of library wines and barrel samples. This tasting tends to feature more “re-run” wines – the same wine and vintage as poured the previous year – than most local tastings, and Al and I tried 15 of these wines this year. I found that in most cases, that additional year in bottle improved the wine – notably the Mount Eden 2012 Estate and Beauregard 2012 Coast Grade bottlings – though that was not true in all cases. As usual at this event, it was interesting to taste Pinots made by different producers using fruit from the same vineyard source. Muns and Lester Family vineyard fruit was on display in quite a few bottlings, and Pinot sourced from Regan and Coast Grade vineyards also showed up at more than one winery table. Tasting these wines from the same vineyards, I thought back to the idea presented in the Technical Session about identifying “signature elements” of Santa Cruz Mountains Pinot. But in the end, I found that the widely differing winemaking styles and techniques of the region’s vintners tend to obscure these signature vineyard elements as much as they showcase them. I think that the variety of winemaking techniques today generally makes this an issue anywhere – and Luke noted that regional or single-vineyard character was likely much easier to identify a century ago, when many modern techniques had not yet been developed, so regional grape-growing and winemaking procedures were more homogenous. The Grand Cruz Tasting remains the best place for a broad sampling of Santa Cruz Mountains Pinot Noir, though as I’ve noted in the past, a few of the area’s best producers are generally missing at this event. And while this is to be expected at most similar tastings, it does tend to skew the perception of this region’s wines, given the relatively small number of producers. Over the years that I’ve attended this event, I’ve found fewer and fewer wines that I felt were overtly flawed, though there were still some this year – fewer with notable volatile acidity but several that were almost certainly affected by brettanomyces. But beyond flaws of this sort, there remains what I feel are other winemaking issues that could be handled better, notably the over-use of new oak – particularly with certain types of oak. 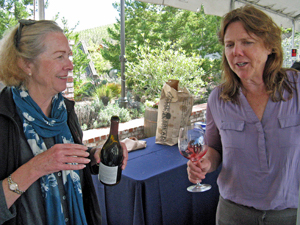 While the quality of viticulture has improved over the years, thanks to Prudy Foxx and others, the quality of winemaking remains inconsistent in this region. As I’ve mentioned before, the area as a whole does not tend to attract top winemaking talent – something that’s true of a number of other California wine regions as well. But there are certainly some top-notch winemakers working in the Santa Cruz Mountains (as well as some from outside the area who work with its fruit), and each year I find one or two newer vintners who are really helping to raise the quality bar for the region. There were plenty of standout wines at this year’s Grand Cruz Tasting, and my two lists this year include 24 wines. The wines on the lists include a range of styles, though most tend to be on the lighter and less-oaky side since I feel this shows the character of Santa Cruz Mountains Pinot fruit to good advantage. There are both fruit-forward wines and ones where fruit plays more of a supporting role – both can showcase the region’s Pinot character well. Favorite producers from past years are well-represented on the lists, including Mount Eden, Santa Cruz Mountain Vineyard, Thomas Fogarty, and Windy Oaks. Relative newcomer Sante Arcangeli was a favorite producer for the second straight year, and Big Basin was a favorite this year as well. Some promising newcomers to the event included Stockwell and Left Bend, while Ser’s inaugural Pinot showed well again this year. And as is evident from the Favorites and Others of Note lists, a number of other producers poured at least one standout wine at the tasting. The 2012 vintage seemed to be showing particularly well at the event, with some of the 2013s perhaps needing more time in bottle. Several of the wines poured from the cool 2011 vintage were also showing quite well – I’ve always felt that these needed more time to really blossom. Once again this year, the Santa Cruz Mountains Pinot Paradise event was a rewarding experience. The Technical Session was thought-provoking, and as always, the Grand Cruz Tasting is the best opportunity you’ll find to sample the Pinot Noirs from the region. It’s a great way to try the latest offerings from some of the area’s top vintners as well as to discover some up-and-coming producers. There are always some surprises at this tasting – one of the things that makes it so much fun. Add to that its relaxed atmosphere and delicious food, and it’s no wonder that this event is a favorite of mine year after year – highly recommended for fans of Santa Cruz Mountains Pinot Noir. There is undoubtedly something special about the best Pinot Noir from the Santa Cruz Mountains, and the Pinot Paradise Grand Cruz Tasting affords a great opportunity to try some of them. While the full potential for Pinot from the region has yet to be reached on a wide scale, this tasting once again showed how good these wines can be. With the fine new venue for the event and a good number of standout wines from a variety of producers, the Grand Cruz Tasting is certainly the place to be each spring for fans of Santa Cruz Mountains Pinot Noir. Alfaro 2013 Pinot Noir, Lester Family Vineyard, Santa Cruz Mountains. Made with 20% whole clusters and aged in about 20% new French oak. Medium-light ruby color, with aromas of black cherry, spice, and a touch of sweet oak. Medium-bodied with good acidity and moderate tannins. 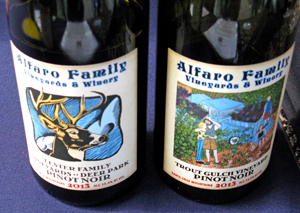 Alfaro 2013 Pinot Noir, Trout Gulch Vineyard, Santa Cruz Mountains. From a 30+ year-old vineyard near Aptos, made with 20% whole-cluster fermentation and about 20% new French oak. Medium-light color, this displayed a more savory character along with flowers, red fruit, and forest floor notes. Brighter on the palate with more structure than the previous wine and chalky tannins on the finish, nice. Comments: Richard and Mary Kay Alfaro established their vineyards and winery in the late 1990s. There are now about 38 acres of vineyards planted on the property, and some portions are now certified organic. Lindsay Paige Vineyard, first planted in 1998, is named for the Alfaros’ daughter. Richard makes the wines. Comments: Said to be the oldest continually-operating winery in the Santa Cruz Mountains, Bargetto celebrated their 80th anniversary in late 2013. Brothers Phillip and John Bargetto ran a winery in San Francisco from 1910 to 1917, and launched the Bargetto label in Soquel immediately following the end of Prohibition. Their 40-acre estate Regan Vineyard, was planted in 1992 in the Corralitos area. Olivia Teutschel is the Bargetto winemaker. Beauregard 2012 Pinot Noir, Coast Grade Vineyard, Ben Lomond Mountain. From four Pinot clones at a vineyard planted in 2008, the wine was aged in 50% new American oak. Medium-light ruby color, with raspberry, flowers, tea leaf, earth, and spice, with vanilla/oak in the background. Medium-bodied and lively on the palate, this finished with refined tannins, nice. Beauregard 2012 Pinot Noir, Beauregard Ranch, Ben Lomond Mountain. From Pommard, 667, and 115 clone vines planted in 2005 at a vineyard dating to 1949, the wine was aged in 50% new American oak. Lighter color, with a more floral aromatic profile along with more forward black cherry fruit and slightly bigger sweet oak and spice components. Medium weight with a bit more structure and a firmer tannic finish – has potential but could use more time in the bottle. Comments: Amos Beauregard first planted 13 acres of winegrapes at his ranch near Bonny Doon in 1949. His grandson Jim and Jim’s son Ryan now manage 105 acres of vineyards in the area. The Beauregard label was founded in 1999, and Ryan makes the wines. They’ve been using a good deal of American oak but have switched to mainly French oak beginning with the 2013 vintage. Coast Grade (originally Nora’s) Vineyard is the family’s newest site, with 17 acres planted in 2008. The small Ben Lomond Mountain AVA is entirely within the larger Santa Cruz Mountains AVA. This was a good showing for the Beauregard Pinots. Big Basin 2013 Pinot Noir, Santa Cruz Mountains. Sourced mostly from Lester Family and Coast Grade vineyards, fermented with about 50% whole clusters and aged in around 25% new French oak. Medium-light ruby color, showing upfront raspberry fruit, spice, and a stony mineral note. Lighter-bodied and lively on the palate, finishing with milder tannins. Big Basin 2012 Pinot Noir, Lester Family Vineyard, Santa Cruz Mountains. Fermented with 42% whole clusters, aged in about 35% new oak. Medium-light color, with bright red fruit, herbs, flowers, spice, and an underlay of sweet oak. Medium weight with more structure than the previous wine, finishing with chalky tannins. Big Basin 2012 Pinot Noir, Alfaro Family Vineyard, Santa Cruz Mountains. From Mount Eden, 115, and 667 clones, 42% whole-cluster fermentation, aged in about 35% new oak. Medium-light color, this displayed bigger earth and spice components, cherry fruit, plus flowers, vanilla/oak, and a hint of pepper on the nose. Medium-bodied with a lively texture and refined tannins, nice. Comments: Located in the Santa Cruz Mountains, Big Basin was established by Bradley Brown in 1998. The first plantings at the estate vineyard came in 2000 and the winery was completed in late 2003. 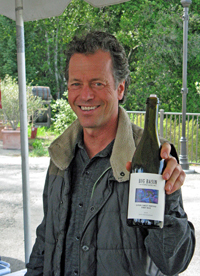 Bradley learned much of his winemaking from John Alban, and the stylistic similarities show in a number of the Big Basin wines. Though better known for its Rhône-style wines, Big Basin has also made very good Pinots, and Bradley poured the best group of them that I’ve tasted yet – they seem to have grown more elegant with each vintage. The wines all go through native fermentation. Burrell School 2011 Pinot Noir, “Principal’s Choice Estate Reserve,” Santa Cruz Mountains. Lighter color, with earth and raspberry aromas, spice, and a touch of sweet oak. Medium-light bodied, this finished with moderate tannins. Burrell School 2012 Pinot Noir, “Principal’s Choice Estate Reserve,” Santa Cruz Mountains. Medium-light ruby, showing more forward black cherry and plum fruit, plus dried herbs, black pepper, and spice. More body and structure than the previous wine, finishing with fairly grippy tannins – this shows potential but needs time. Comments: David and Anne Moulton started work on their estate vineyard in 1973. The first plantings were Chardonnay and Merlot, with Pinot Noir added in 2002. The estate vineyard is at 1,600-foot elevation in the Summit area, and includes Pommard, 115, 667, and 777 Pinot clones. David makes the wines, and ages them in mostly-new French oak. 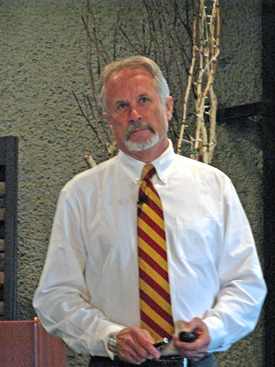 Comments: Cinnabar was founded in 1981 by Tom Mudd, on a site in the hills overlooking Saratoga. He planted 22 acres in 1984 and 1985, and completed a winery building – complete with caves – in 1987. Eight more acres were planted in 1991. The estate vineyard and winery were sold to Mount Eden when Tom passed away in 2007, but the Cinnabar label has continued to produce wine with purchased fruit. Their 2012 Pinot was sourced from Lester Family Vineyard, planted in the mid-1990s near Corralitos. 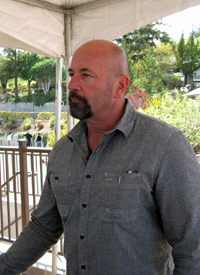 George Troquato is the Cinnabar winemaker. Clos LaChance 2011 Pinot Noir, “Reserve,” Santa Cruz Mountains. Lighter garnet/ruby color, showing strawberry, spice, and floral aromas with undertones of sweet oak. Medium-bodied with good acidity and moderate tannins. Clos LaChance 2012 Pinot Noir, “Murphy’s Choice,” Santa Cruz Mountains. A barrel selection, the fruit source changes each vintage – the 2012 was sourced from three vineyards. Medium-light color, with upfront earth and spice on the nose and plummy fruit and tea leaf in the background. Bigger and more structured than the previous wine, finishing with grippy tannins. Comments: Clos LaChance owners Bill and Brenda Murphy first planted a small “backyard vineyard” with some Chardonnay vines at their property in the Saratoga area in 1987. One thing led to another, and their first commercial wines were released from the 1992 vintage. Bill and Brenda continue to run the winery, along with their daughters, and they now farm other vineyards in addition to their own. The Clos LaChance wines are made by Jason Robideaux. Clos Tita 2012 Pinot Noir, Estate, Santa Cruz Mountains. A field blend that includes a tiny bit of Viognier and Chardonnay, fermented with 15% whole clusters and aged for two years in 50% new French oak. Medium-light ruby color, with black cherry fruit, spice, and notes of flowers and herbs. Medium weight on the palate with good structure and moderate tannins, nice. Clos Tita 2001 Pinot Noir, “Pinot Noir Cuvée,” Santa Cruz Mountains. Sourced from about 20% estate fruit plus fruit from the Corralitos area. Medium-light garnet color, this showed earthy and mildly leathery notes along with forest floor and subtle plum and black cherry fruit. Medium-bodied, this still displayed a chalky tannic finish. Comments: Clos Tita is the label of David and Britta Estrada, who first planted their vineyard in the Scotts Valley area in 1990. The vineyard includes Martini, 113, 114, and 777 Pinot clones, and the wines are typically aged in mostly new French oak. Cooper-Garrod 2012 Pinot Noir, “Two Vineyards,” Estate, Santa Cruz Mountains. Sourced from George’s and Finley vineyards, 100% destemmed. Medium-light ruby, featuring red fruit, spice, tea leaf, and a touch of sweet oak on the nose. Medium-bodied with good structure and refined tannins, nice. Comments: Cooper-Garrod is run by winemaker Bill Cooper and vineyard manager Jan Garrod, who first began replanting old orchards with winegrapes in 1972. The estate vineyards are located above Saratoga. Only 2.5 acres are planted to Pinot Noir, with the 2-acre Finley Vineyard being the largest portion, planted in 2004. The estate vineyards are certified organic. Bill poured his wines at the tasting. Dancing Creek 2010 Pinot Noir, “Legato,” Santa Cruz Mountains. Sourced from Trout Gulch Vineyard, aged in American oak. Lighter ruby color, with earth/leather aromas along with black cherry and spice. Medium weight with fairly big structure and firm tannins. Comments: A fairly new producer from the Corralitos area, Dancing Creek presented a contrast of neutral French oak and newer American oak in their two wines sourced from Trout Gulch Vineyard. The vineyard was planted in the mid-1980s above Aptos by Bernard and Gerry Turgeon. House Family 2011 Pinot Noir, Estate, Santa Cruz Mountains. Includes Calera, Swan, and 667 clones, made with about 33% whole-cluster fermentation. Lighter ruby/garnet color, this had savory and black pepper aromas along with strawberry, tea leaf, and a touch of oak. Medium weight with a fine texture and a slightly saline character, finishing with a stony mineral note and refined tannins, very nice. Comments: Located near The Mountain Winery (Dave House is co-owner of that historic property) in the hills above Saratoga, the first commercial vintage from the estate vineyard was in 2006. Fruit is sourced entirely from the estate vineyard. Jim Cargill now heads up the winemaking at House Family, while Jeffrey Patterson of Mount Eden still consults for them. Hunter Hill 2013 Pinot Noir, Estate, Santa Cruz Mountains. Medium-light ruby color, very fruit-forward, with black cherry and plum aromas along with touches of flowers and sweet oak. Medium-bodied with moderate tannins. Hunter Hill 2013 Pinot Noir, “Partners’ Reserve,” Estate, Santa Cruz Mountains. Similar color, this also had lots of upfront fruit plus bigger vanilla/oak and spice components. Slightly richer mouthfeel with a firm tannic finish. Comments: Vann & Christine Slatter are proprietors of Hunter Hill, with an estate vineyard in the hills above Soquel. The property had once been the Manildi farm, where Christine’s grandparents had planted an orchard as well as grapevines. Vann & Christine first planted Merlot there in 1992, and added Syrah in 2002. That same year, they grafted some of their vines to Pinot Noir. Vann continues to make the wines. Kings Mountain 2011 Pinot Noir, “Bacchus,” Estate, Santa Cruz Mountains. Medium-light garnet, with a big vanilla/oak component along with ripe black cherry fruit and spice. Fairly rich mouthfeel, this finished with chalky tannins. Kings Mountain 2010 Pinot Noir, Estate, Santa Cruz Mountains. Medium-light color, this displaying plum and spice but with a notable barnyard aroma that detracted from this wine. Medium-bodied with moderate tannins. Comments: Winery owner Mike Markkula was an early investor and CEO at Apple Computer. The estate vineyard was planted in 1992 above the Woodside area, and they’re dry-farmed. Winemaker Brian Caselden ages the Pinots for 18 months in 100% new French oak and another two years in bottle prior to release. Left Bend 2012 Pinot Noir, Muns Vineyard, Santa Cruz Mountains. From 115, 667, and 777 clones, made with 25% whole clusters and aged in 40% new French oak. Medium-light ruby color, with plummy and spicy aromas, plus notes of tea leaf, earth, and sweet oak. Medium weight with good structure, finishing with fine, chalky tannins, nice. Left Bend 2013 Pinot Noir, Muns Vineyard, Santa Cruz Mountains (barrel sample). To be bottled about a month after the tasting. Similar color to the previous wine, this showed pure fruit character, along with a hint of flowers. Fairly big and structured in the mouth, this will need some bottle age to unwind. Comments: Left Bend is the project of friends Richard Hanke and winemaker Gary Robinson. It’s a fairly new winery, with 2010 being their inaugural vintage. The winery name refers to slight bend in the San Andreas Fault that helped form the Santa Cruz Mountains. Left Bend also produces Cabernet Sauvignon, Cabernet Franc, and Syrah, all sourced from Santa Cruz Mountains vineyards including Gary’s own small Monte Roble Vineyard. DaVine 2012 Pinot Noir, Byington Vineyard, Santa Cruz Mountains. Medium-light color, this displayed upfront vanilla/oak aromas, with cherry and spice in the background. Medium-bodied with moderate tannins. DaVine 2012 Pinot Noir, Regan Vineyard, Santa Cruz Mountains. Slightly darker ruby color, with strong leather and barnyard aromas, not very pleasant. Comments: MJA also produces wine under the Serene Cellars label and sells Kona coffee under the Diamond Head Coffee Company label. Owner Marin Artukovich started in the Kona coffee business in 1990, and he added wine to his portfolio in the mid-2000s, focusing on Napa Valley Cabernet and Sauvignon Blanc and Santa Cruz Mountains Pinot Noir. Pinot fruit from an estate vineyard should be coming before long. Domaine Eden 2012 Pinot Noir, Santa Cruz Mountains. Sourced from Mount Eden, Calera, Martini, Swan, 667, 777, and 828 clones from the old Cinnabar property purchased by Mount Eden in 2007, and aged in 40% new French oak. Medium-light ruby color, this showed ripe raspberry fruit, earth, and lots of spice on the nose. Medium weight with bright acidity and milder tannins on the finish. Mount Eden 2012 Pinot Noir, Estate, Santa Cruz Mountains. From the estate vineyard, aged in about 75% new French oak. Medium-light color, featuring more savory and earthy character than the previous wine, along with raspberry, a touch of sweet oak, and a stony mineral note. Lively mouthfeel with a bigger structure, finishing with moderate tannins – this has developed very well in the past year and should continue to do so, very nice wine. Comments: Mount Eden is one of California’s most historic vineyard sites, with a story that extends back to legendary vintners Paul Masson and Martin Ray. The vineyard at Mount Eden was replanted beginning in 1984 with a variety of Dijon and “heritage” clones, including some propagated from the original vines planted there. Pinots undergo native yeast fermentations in small lots, then go into mostly new oak along with some one-year old oak, and barrel-aged for about 18 months. 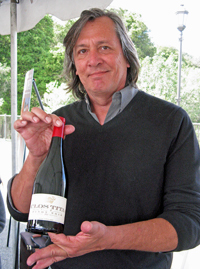 Proprietor/winemaker Jeffrey Patterson was on hand at the tasting, and the 2012 Estate Pinot was one of the event’s standouts. The Mountain Winery 2010 Pinot Noir, “Reserve,” Estate, Santa Cruz Mountains. Medium-light color, this showed raspberry and spice aromas along with earth and vanilla/oak. Medium weight with a moderately rich mouthfeel and firm tannins. The Mountain Winery 2012 Pinot Noir, Estate, Santa Cruz Mountains. Medium-light ruby color, with slightly riper bright red fruits, tea leaf, baking spice, and undertones of flowers and sweet oak. Medium-bodied with vibrant acidity and moderate tannins, nice. 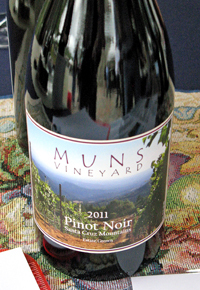 Muns 2011 Pinot Noir, Estate, Santa Cruz Mountains. Medium-light garnet color, this had higher-toned red fruit plus a savory component, tea leaf, and spice. Medium-light bodied with lively acidity and moderate tannins, nice. Muns 2012 Pinot Noir, Estate, Santa Cruz Mountains. Medium-light ruby, showing more upfront black cherry fruit along with spice, earth, and sweet oak. More structured on the palate, with a firmer tannic finish. Comments: At 2,600-foot elevation, 13-acre Muns is the highest Pinot vineyard in the area, planted from 1998 to 2005 with 114, 115, 667, and 777 clones. Fruit from the vineyard is currently sold to over a dozen other producers. The first commercial release of Muns wines was from the 2004 vintage. The wines are made by noted local winemaker Tony Craig. Both wines tasted were aged for 17 months in 33% new Hungarian oak. Muns uses mostly Hungarian oak barrels for aging the Pinots – I thought they worked better with these wines than some of the others at the event. As usual, proprietors Ed Muns and Mary Lindsay poured their wines at the tasting. Nicholson 2012 Pinot Noir, “Cuvée,” Santa Cruz Mountains. Sourced from Fog’s Edge and Belle Farms vineyards. Medium-light ruby color, this featured higher-toned cherry aromas with earth and lots of spice. Medium-bodied with a fairly smooth mouthfeel and milder tannins. Nicholson 2012 Pinot Noir, “Brooks Block,” Estate, Santa Cruz Mountains. Sourced from the estate vineyard Brooks Block. Medium-light color, more fruit-forward raspberry, plus vanilla/sweet oak and hints of flowers and dried herbs. Bigger structure on the palate, with a chalky tannic finish. Nicholson 2011 Pinot Noir, “Estate Reserve,” Santa Cruz Mountains. Sourced from older vines at the estate vineyard. Medium-light color, showing more intense fruit and spice aromas along with a bigger oak component. Slightly richer texture, with moderate tannins. Comments: Brian and Marguerite Nicholson first planted their vineyard in the Corralitos area in 1996, with more vines added in 2004. They have about 2.5 acres of Pinot Noir, with five Pinot clones mixed through the vineyard in a “selection massale” style. John Ritchey is the Nicholson winemaker. Comments: Owner / winemaker Denis Hoey worked with Santa Cruz Mountain Winery’s Jeff Emery as well as for Berkeley’s Bison Brewery before launching his own label in 2005. Besides Pinot Noir, Odonata produces a white Rhône-style blend, sparkling Sangiovese Rosé, Malbec, Syrah, Petit Sirah, and a Syrah dessert wine. Denis purchased the old Marilyn Remark Winery south of Salinas in 2014 and moved his production there but plans to continue working with Santa Cruz Mountains fruit. Roudon-Smith 2012 Pinot Noir, “Private Reserve,” Santa Cruz Mountains. Sourced entirely from Regan Vineyard, aged in about 25% new French oak. Lighter color, this showed ripe and forward black cherry fruit, spice, with floral notes and a background of sweet oak. Medium-bodied with good structure and moderate tannins. Roudon-Smith 2013 Pinot Noir, “Private Reserve,” Santa Cruz Mountains. Recently-bottled, tank-aged with added oak spheres. Medium-light color, displaying more subtle fruit along with a touch of flowers and a bigger vanilla/oak component. Medium weight with fairly refined tannins, this could use more time in the bottle but shows potential. Comments: The winery was established in 1972 in the Scotts Valley area by Bob and Annamaria Roudon and Jim and June Smith. A winery building was completed in 1978. Al and Diane Drewke joined the business in 2006, and in 2011 they became sole owners of Roudon-Smith. The estate vineyard is planted to Chardonnay, while Pinot is sourced from other local vineyards. Russian Ridge 2012 Pinot Noir, Santa Cruz Mountains. Sourced entirely from the estate vineyard. Medium-light color, with plummy fruit, herbs, and a stony mineral note. Big and structured in the mouth, this finished with grippy tannins. Comments: This small family winery was established in 2008 and makes wines from a number of grape varieties, sourced from Napa to Paso Robles. The estate vineyard is in the Summit area. Owner Scott Townsend makes the wines at Cuvée Wine Cellars in San Carlos. Santa Cruz Mountain Vineyard 2012 Pinot Noir, Branciforte Creek Vineyard, Santa Cruz Mountains. From mostly Pommard clone vines planted in 1988. Medium-light ruby color, this displayed bright black cherry fruit, tea leaf, flowers, and a touch of woodsy/earthy forest floor aromas. Medium-bodied with a lively texture and moderate, chalky tannins, nice. Santa Cruz Mountain Vineyard 2003 Pinot Noir, “Vine Hill Reserve,” Estate, Santa Cruz Mountains. This unique bottling includes the winery’s last fruit from 30+ year-old vines at their original Jarvis Vineyard site along with their first fruit sourced from Branciforte Creek and Bailey's Branciforte Ridge vineyards. Fairly light garnet color, with earth, cherry, and spice, and dried herbs on the nose. Medium weight with good structure and refined tannins – this still has plenty of life left in it. Comments: The winery was established by Ken Burnap in 1975, at the Vine Hill property that he purchased from David Bruce, who had planted Pinot vines there in 1968. A century earlier, the Jarvis brothers had planted a vineyard on the same property. Ken retired from the business in 2003, selling the vineyard property to another vintner but selling the winery label to his assistant Jeff Emery, who continues to run the winery and make the wines. Branciforte Creek Vineyard, only about a mile from the old estate vineyard, was planted in 1988 to Pommard clone Pinot. Jeff poured his wines at the tasting – the Branciforte Creek bottling is a standout nearly every vintage, and it was a treat to taste the older bottling. Sante Arcangeli 2013 Pinot Noir, “Clone 32 – Selezione Suzie,” Split Rail Vineyard, Santa Cruz Mountains. Entirely from Clone 32, 100% destemmed, aged in 50% new oak. Medium-light ruby color, featuring pretty floral aromas upfront, plus cherry fruit, tea leaf, and a touch of forest floor. A bit bigger in body and structure than the previous wine, with a lively texture and firm tannins – should develop well in the cellar but the aromatics are beautifully pure right now. Comments: Established in 2010 by John Benedetti, Sante Arcangeli is named for John’s great-grandfather, who settled in the San Mateo coast town of Pescadero. John has credited well-known Anderson Valley Pinot winemaker James MacPhail as well as local winemaker Ryan Beauregard and the Brassfield family of Heart O’ The Mountain for helping him develop his winemaking skills. The Pinots often but not always include some whole clusters in the fermentations, and both French and Hungarian oak are used for aging. Split Rail Vineyard was planted from 1986 to 1991 by Greg Stokes, David Bruce’s vineyard manager. Located above the Corralitos area at about 1,700-foot elevation, it’s planted partly to the old David Bruce Pinot selection – a field selection that includes Mount Eden, Martini, Wädenswil and Pommard clones. John poured his wines at the tasting, and a couple of them were standouts. Savannah-Chanelle 2011 Pinot Noir, Santa Cruz Mountains. Sourced from Regan and Muns vineyards, plus a small percentage from Tondré Grapefield in Santa Lucia Highlands, aged in 35% new Hungarian oak. Medium-light color, this was fruit-forward, with plum and black cherry aromas plus spice and sweet oak. Fairly rich with a smooth texture, finishing with moderate tannins. Savannah-Chanelle 2012 Pinot Noir, Muns Vineyard, Santa Cruz Mountains. Aged in 33% new Hungarian oak. Medium-light ruby color, this had more upfront spice than the previous wine and a more red fruit profile. Medium-bodied and more structured on the palate, with a more grippy tannic finish. Comments: Mike and Kellie Ballard purchased the Savannah-Chanelle property in 1996 – it had previously been home to the old Congress Springs Vineyards. Located in the Saratoga area, its wine history goes back much further – Pierre C. Pourroy Winery was there prior to Prohibition. The property went through other owners in subsequent years, with the vineyard sometimes falling into neglect before being restored under Victor Erickson and Daniel Gehrs of Congress Springs in the 1970s. There is only a tiny bit of Pinot planted there, though, so nearly all the Pinot fruit is purchased. 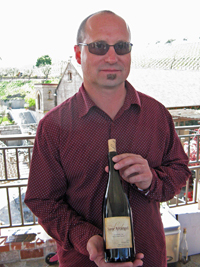 Tony Craig has been the winemaker since 2003. The wines are aged in Hungarian oak and the bottles use synthetic cork closures. Ser 2012 Pinot Noir, Santa Cruz Mountains. Sourced from 40% Lester Family, 30% Byington, and 30% Lilo vineyards, aged in about 10% new French oak. Lighter ruby color, featuring forest floor and mushroom aromas along with black cherry, tea leaf, and a touch of spice. Medium-bodied with a smoother mouthfeel and refined tannins, nice. Comments: Ser is a new winery, with 2012 being the inaugural vintage. 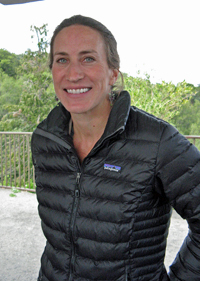 Owner/winemaker Nicole Walsh is the associate winemaker of Bonny Doon Vineyard. Her wines use native yeast fermentations and she makes no additions during the winemaking process. Nicole poured this first release last year as well, and it has developed nicely over that time. It will be worth keeping an eye on Ser for future releases. Silver Mountain 2009 Pinot Noir, Muns Vineyard, Santa Cruz Mountains. From 114, 115, 667, and 777 clones, aged in 33% new Hungarian oak. Medium-light garnet/ruby color, this displayed a savory character along red fruit, spice, and forest floor notes. Medium weight and lively on the palate, with moderate, chalky tannins that sneaked up on the finish, nice. Silver Mountain 2009 Pinot Noir, Miller Hill Vineyard, Santa Cruz Mountains. From 115 and 667 clone vines planted in 1997, aged mostly in Hungarian oak. Similar color to the previous wine, this had a more earthy profile plus more subtle fruit aromas, spice, and a touch of sweet oak. A bit bigger and more structured on the palate with a firmer tannic finish. Comments: Founded in 1979 by Jerold O’Brien, Silver Mountain is located in the Summit area at an elevation of 2,100 feet. Joseph Swan was one of Jerold’s winemaking mentors, so it’s appropriate that some of the estate vineyard’s Pinot vines, planted in 2003, are Swan clone. Both Swan and Pisoni clone vines are planted on their own roots, and Dijon clones are planted there as well. The vineyard is certified organic. Wines are aged mostly in Hungarian oak, and they are released with more age than most Pinots – the 2009 vintage wines are Silver Mountain’s current releases. Silvertip 2011 Pinot Noir, Estate, Santa Cruz Mountains. From entirely destemmed fruit, aged in 25% new French oak. Medium-light garnet color, featuring red fruit, savory and floral notes, with stony mineral undertones. Medium-bodied with a lively texture, finishing with fine tannins, nice. Silvertip 2012 Pinot Noir, Estate, Santa Cruz Mountains. Medium-light color, this showed more earth and leather on the nose, plus black cherry and plum fruit, spice, and a touch of vanilla/oak. A bit bigger and more structured than the previous wine, with moderate tannins. Comments: Silvertip is a newer producer owned by the Nelson family. Their estate vineyard, at about 1,700-foot elevation on the western side of Summit Road, had previously been a Christmas tree farm. The winery is named for the Silvertip Fir Christmas trees that were some of the family’s favorites. In 1999 the site was planted with nine acres of Chardonnay, Syrah, and with 115, 667, 828, and Pommard clone Pinot Noir. The winery was established in 2009, and the wines are made by Paul Stroth. The wines are made exclusively from estate fruit, and aged entirely in French oak, no more than 33% new. The early Pinot releases from Silvertip have been quite promising. Stockwell 2012 Pinot Noir, Lester Family Vineyard, Santa Cruz Mountains. Aged in about 25% new French oak. Lighter ruby color, this showed bright red fruits, tea leaf, earth, and spice aromas. Medium weight on the palate, with moderate tannins on the finish. Stockwell 2012 Pinot Noir, Coast Grade Vineyard, Santa Cruz Mountains. From 115, 667, 828, and Pommard clones. Medium-light ruby, with a more stony mineral character plus cherry, tea leaf, and hints of flowers and sweet oak. Medium-bodied with lively acidity and firm but refined tannins, nice. Comments: Proprietor Eric Stockwell first made wine as a hobby. A steel welder and fabricator by trade, he started trading welding services to grape growers and wineries for grapes and equipment, eventually launching his wine label with the 2010 vintage. He credits local vintners including Beauregard and Santa Cruz Mountain Vineyard for helping him learn the ropes of winemaking. Eric was behind the table at the event, and this was my first time tasting the Stockwell wines – both good, with the Coast Grade bottling being a standout. It should be worth watching this new label. Storrs 2011 Pinot Noir, Christie Vineyard, Santa Cruz Mountains. Entirely from Pommard clone. Light garnet color, this had higher-toned red fruit, spice, and a touch of sweet oak. Medium-light weight, with fine tannins on the finish. Storrs 2012 Pinot Noir, Santa Cruz Mountains. Sourced from several vineyards including the estate Hidden Springs Ranch. Lighter ruby color, featuring more upfront ripe raspberry fruit, tea leaf, earth, and spice. Medium-bodied, this finished with moderate tannins. Comments: Steve and Pamela Storrs started their winery in 1988. Both studied at UC Davis, where Steve studied viticulture and Pamela studied enology. They planted an estate vineyard in the Corralitos area in 2007 with Chardonnay and Pinot Noir, and it’s certified organic. They’re planning to open a new energy-efficient winery near the vineyard soon. Christie Vineyard is one of the oldest in the Corralitos area. 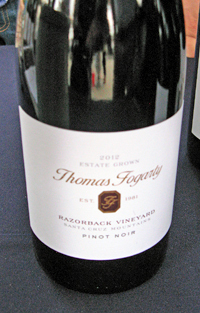 Thomas Fogarty 2012 Pinot Noir, Razorback Vineyard, Estate, Santa Cruz Mountains. From Swan, 115, 667, and 777 clones, made with 33% whole clusters and aged in 32% new French oak. Medium-light ruby color, with savory aromas along with bright cherry fruit, spice, forest floor, and notes of flowers and vanilla/oak. Lighter-bodied with a lively mouthfeel and fine tannins, nice. Thomas Fogarty 2012 Pinot Noir, Will’s Cabin Vineyard, Estate, Santa Cruz Mountains. From Swan and Mount Eden clones at the estate Gist Ranch site, made with 25% whole clusters and aged in 25% new French oak. Medium-light color, this displayed more upfront ripe fruit and spice than the previous wine. Medium weight on the palate and more structured, finishing with moderate tannins. Thomas Fogarty 2012 Pinot Noir, Rapley Trail Vineyard, Estate, Santa Cruz Mountains. From Martini clone, made with 33% whole clusters and aged in 30% new French oak. Slightly deeper ruby color, showing herbs, raspberry fruit, earth, and spice, with undertones of sweet oak. Medium-bodied with bigger structure and firmer tannins on the finish – this will need time but should develop nicely. Comments: Dr. Thomas Fogarty, a famed surgeon and inventor of numerous medical devices, first planted Chardonnay and Pinot Noir at his property in the mountains above Woodside in 1978. Three years later, he founded his winery. Michael Martella was with him from the start as winemaker and viticulturist. Michael stepped aside in early 2013, and Nathan Kandler, who has been with the winery since 2004, became the Thomas Fogarty winemaker. The main estate property, at about 2,000-foot elevation, has about 25 acres of vines, including three distinct Pinot sites – Windy Hill, Rapley Trail, and Razorback. This was a strong showing for the Thomas Fogarty Pinots. Villa del Monte 2012 Pinot Noir, Regan Vineyard, Santa Cruz Mountains. Aged in both French and American oak. Light garnet/ruby color, with upfront black cherry fruit, smoke, and earth on the nose. Medium-bodied, finishing with moderate tannins. Comments: Located on Summit Road, Villa del Monte is the project of vintners John Overstreet and Neil Perrelli. The winery also produces Chardonnay, Cabernet Sauvignon, Merlot, Syrah, Syrah Rosé, and Zinfandel. Windy Oaks 2012 Pinot Noir, “Limited Release – 100% Whole Cluster,” Estate, Santa Cruz Mountains. Fermented entirely with whole clusters with some extended maceration, aged for 22 months in about 45% new French oak. Light ruby color, featuring bright strawberry aromas along with tea leaf, flowers, spice and vanilla/oak. Medium-bodied with a bright texture and fine acidity, finishing with firm tannins – well-integrated whole-cluster character, this should age nicely. Windy Oaks 2012 Pinot Noir, “Henry’s Block,” Estate, Santa Cruz Mountains. Sourced from 2A clone vines in an older one-acre vineyard block, aged for 22 months in about 40% new French oak. Slightly darker color, this displayed more floral aromatics, plus lots of spice and hints of dried herbs and sweet oak. Medium weight and lively on the palate, with a grippy tannic finish. Windy Oaks 2012 Pinot Noir, “Proprietor’s Reserve,” Estate, Santa Cruz Mountains. Sourced mainly from the 1½ acre Bay Block of the original vineyard, with about 50% native fermentation with 50% whole clusters, selected from favorite barrels. Medium-light ruby color, with red fruits, earth, tea leaf, spice, and vanilla/oak on the nose. Slightly bigger and more structured on the palate, finishing with firm tannins. Comments: Windy Oaks proprietors Jim and Judy Schultze purchased their Corralitos property in 1995, and began planting their estate vineyard the next year. More plantings followed through 2002, and the estate vineyard is now about 22 acres. Henry’s Block is part of the main vineyard site adjacent to the winery, which was completed in 2001. Jim typically makes his Pinots with around 25-40% whole-cluster fermentation and about 50% native yeast. Windy Oaks consistently makes some of the Santa Cruz Mountains’ best Pinots. Judy was behind the winery table at the tasting, and all three wines were very good, with the “100% Whole Cluster” bottling being a particular standout. Woodside 2012 Pinot Noir, Estate, Santa Cruz Mountains. Sourced from over 20 small vineyard sites that Woodside manages. Medium-light color, with red fruits, herbs, and lots of spice. Medium-bodied with a slightly bitter noted on the tannic finish. 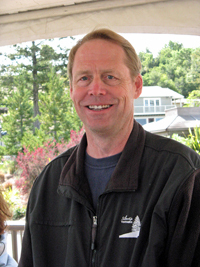 Comments: The oldest winery in San Mateo County, Woodside was founded by Bob Mullen in 1960. The winery is unusual in that it farms over 20 separate small vineyards in the Woodside area, totaling over 17 acres. Bob sold the majority of the winery to Louis "Buff" Giurlani in 2010. The wines are made by Brian Caselden. Wrights Station 2012 Pinot Noir, “Far Away Block,” Estate, Santa Cruz Mountains. From 667 and 777 clones grafted to 30-year old Chardonnay rootstock, entirely destemmed. Lighter garnet color, this showed subtle red fruit aromas, along with forest floor and dried herb notes. Medium-light bodied, this finished with moderate tannins. Wrights Station 2012 Pinot Noir, “Arena Block,” Estate, Santa Cruz Mountains. From 667 and 777 clones. Similar color to the previous wine, with a more high-toned red fruit character, plus earth and spice components. Lively mouthfeel, with medium tannins. Comments: Proprietor Dan Lokteff purchased the vineyard property in 2009, and opened a tasting room in 2014. Located in the Summit region, the vineyard is on sand, clay, and slate soil, and includes Chardonnay vines planted in 1983 along with Pinot planted in 2000. The winery name refers to a long-gone railway station and town on the old route from Los Gatos to Santa Cruz.